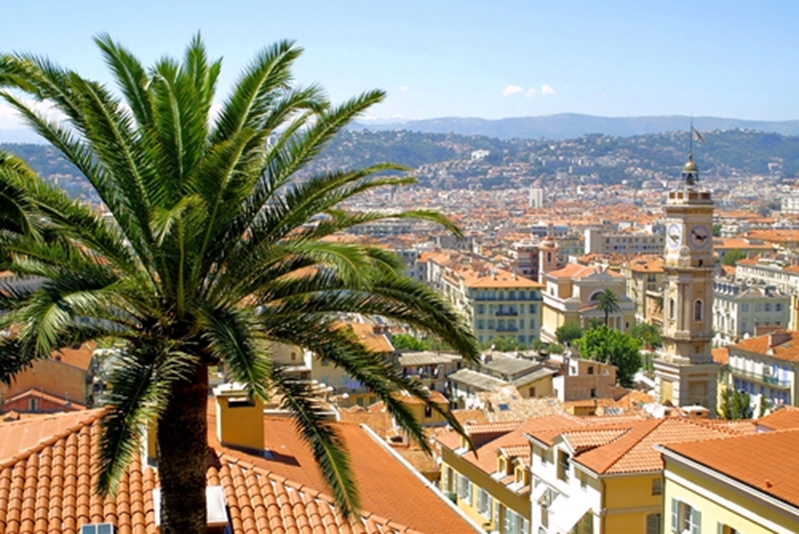 Set in the sun-soaked French Riviera, the city of Nice is beloved by the locals for its charming mix of chic sophistication and old world nostalgia. Whether you're sipping an icy drink on the beach our strolling down the boulevard, it's almost impossible not to think Nice is nice. Also known as petit dej, for short, the French are known to enjoy a continental breakfast, replete with pastries, fruit and some of the best coffee around. Here in Nice, you can start your day at the wonderful Caffe Vergnano 1882, renowned for providing a true French staple – a perfect cafe creme, or latte. Snag a pavement facing table and allow yourself a relaxed start to your day as you nibble on a croissant or baguette. Remember, in France, a coffee or "un cafe" is just espresso. If you want it with milk, ask for "un cafe creme" instead of "cafe au lait", as the latter doesn't really exist in France. Step into the world of Henry Matisse, a great artist and a master of colour who lived from 1869-1954. An important figure in the post-impressionist and fauvism movements, Matisse's works ranged from vibrant, colour blocking portraits to magnificent sculptures. Now you can get a chance to see a selection of the artist's great masterpieces inside the Italian-style villa house, set in the quiet, leafy suburb of Cimiez. On your explorations inside, you'll discover everything from oil paintings to Matisse's famous cut outs. Looking across the way, you will be able to see the grandiose Regina building, where the artist lived for several years within its opulent white washed architecture. A hop, skip and a jump across from the Matisse Museum, you'll find the Gallo-Roman archaelogical sites of Cimiez and Terra Amata. You can walk amongst the ruins of an arena, as well as the thermal baths adjacent to the Archaeological Museum, allowing you to have a glimpse at what life might have looked like here in 100-200 A.D. The museum is closed on Tuesdays, but a guided tour is a pinch at a few Euros per person. You can walk here from the centre of town, but make sure you have decent shoes for the uphill trek! If you're short on time, you can hop on one of the local municipal buses. Ah, the ocean. 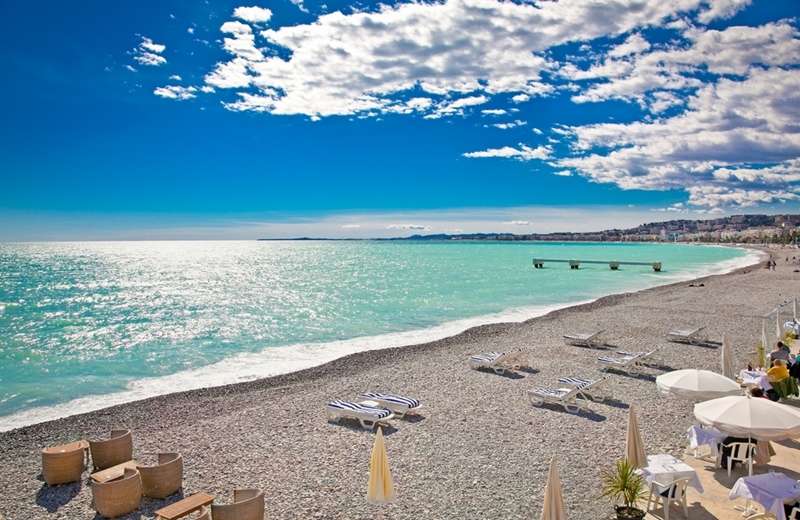 At its heart, Nice is a maritime town, and its magnificent stretch of pebble beach along the Mediterranean sea is the perfect place to kick off your shoes and relax. Many of the public beaches here have their own restaurant where you can grab a cocktail or a late lunch under the golden Nicoise sun. At places like Blue Beach, you can hire an umbrella or a sun lounger for a small fee, to spend your afternoon in style. Be warned, when we say pebbled beach, we mean big pebbles, or galets. Carried down by the rivers, these large, smooth stones are what makes the beaches here so unique, but they aren't the most comfortable to lie or walk on for long periods of time. This perennial favourite is the perfect place to grab some mouthwatering French fare, in a welcoming, unpretentious setting. Book to avoid disappointment, as this buzzing bistro fills up quick on both of its floors! 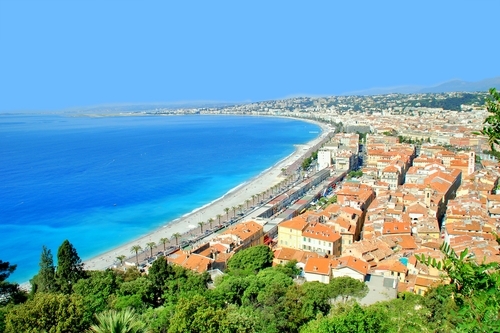 Take a walk down Nice's most famous boulevard, right on the beach front. Bordered by tall palm trees, this famous pavement was funded, unsurprisingly, by the English colony established here in 1822. It sweeps past the Baie des Anges (Angel Bay), a spot supposedly beloved by the English. You can either take your time walking down 'la Prom', as it's affectionately known, or hire a bike or some roller skates from the Roller Station. Don't miss the sight of Hotel Negresco, the lavish 5 star establishment that has occupied this sea view spot for over a century since its opening in 1913. After a leisurely start to your morning, head across to the bus station, or the Gare routiere and buy a return ticket to the hilltop village of Eze. 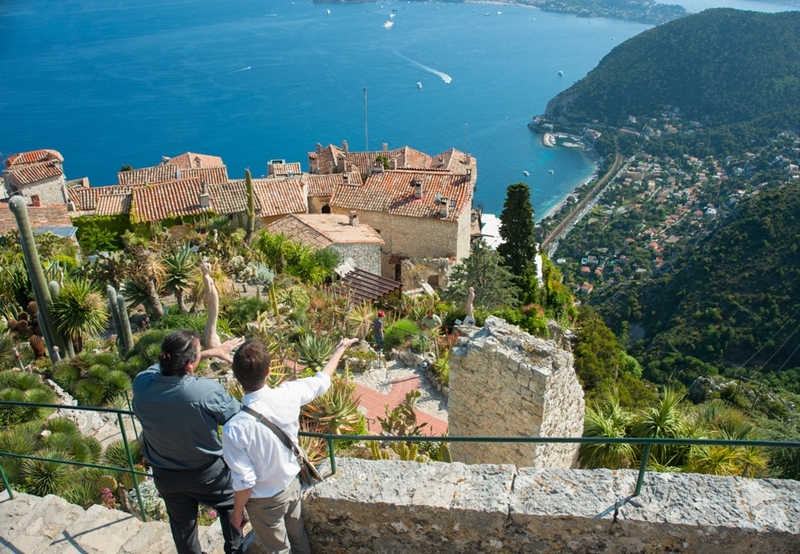 A place with mediaeval roots, Eze has some of the most incredible views out over the city below, and makes for a wonderful outing from the city. Elevated over 400 metres above sea level, as you walk through the cobbled streets, you'll be able to spot the ghost of the 12th century castle that once crowned the hill. Worth a special mention is the perfumerie of Fragonard, where you can take a tour behind the scenes of the world's most iconic perfumes.